As we count down the final hours before Mainnet launch on Nov 12 at 7 PM (19:00 UTC), and the excitement builds, we want to keep everyone updated. Our latest testnet ran with revised and updated versions of all the critical fundamentals for BTG to go live tomorrow. You can think of it as our “Release Candidate” for the software that underlies the Bitcoin Gold network. We’re thrilled to report the testnet has been a complete success. 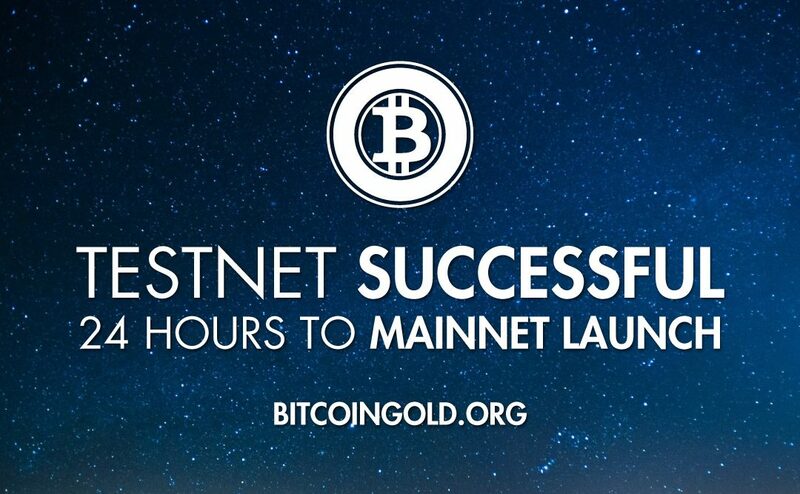 All systems are GO for Mainnet Launch in 24 hours! Many service services have reported success working against the testnet. Others continue to work to improve their user experience. We’re happy to report that more are announcing support for BTG every day. In the interest of fairness, we are refraining from mentioning specific providers at this time, so we ask that users contact their preferred providers for updates on BTG support. Meanwhile, we will keep the main website updated with confirmed Bitcoin Gold supporters. The testnet was a necessary step in order to success, but those who take projects seriously take testing seriously, and this is some seriously good news! Thanks, again, to the community for contributing hashpower to the testnets, and to all the third parties working so hard to ensure safe, effective integration into the ecosystem at launch.